The Templeton World Charity Foundation awarded $550,000 to Emory mathematician Ken Ono, for a global program to identify and nurture gifted students in the areas of science, technology, engineering and math (STEM). The program, now known as the Spirit of Ramanujan STEM Talent Initiative, began in 2016 with pilot funding of $100,000 from the Templeton Foundation. 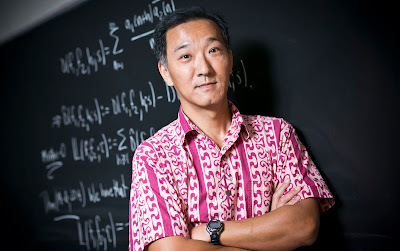 “This additional funding will allow us not only to continue the program, but to expand its mission and impact,” says Ono, Asa Griggs Candler Professor Mathematics at Emory and the vice president of the American Mathematical Society. The pilot Spirit of Ramanujan program, or SOR, focused on finding exceptional young mathematicians, and awarded grants to 16 grade-school students from across the United States as well as from China, Egypt, India, Kenya and Qatar. SOR matched the mathematicians with mentors and the grants funded summer research and enrichment activities. SOR will now also offer similar opportunities for individuals showing exceptional promise for STEM fields in which mathematics plays a prominent role, such as computational chemistry, computer science, electrical and computer engineering, mathematical biology, mathematical physics and statistics. Up to 30 eligible people each year will be awarded Templeton-Ramanujan Fellows Prizes (financial grants up to $5,000 per award to cover summer enrichment/research programs) or Templeton-Ramanujan Scholarly Development Prizes (educational materials such as STEM books). "The Spirit of Ramanujan initiative aims to break the mold and find brilliant outliers who may not be thriving in the system, so we can match them up with the resources they need," says Emory mathematician Ken Ono, one of the founders of the initiative. The SOR initiative was inspired by the subject of the film, Indian mathematician Srinivasa Ramanujan. A poor Hindu college dropout who was self-taught in mathematics, Ramanujan sent a letter containing some of his theories to British mathematician G.H. Hardy in 1913. Hardy was so impressed that he invited Ramanujan to Cambridge to study and collaborate. His mentorship burnished Ramanujan’s insights and brought them to a world stage. Ramanujan's work played a central role in the development of modern number theory and algebraic geometry, changing math and science forever. Although the expanded SOR initiative is open to all ages, preference will be given to those under 32 — the age Ramanujan was when he died. The SOR initiative invites people worldwide to solve creative mathematical puzzles via Expii.com’s Solve feature, to identify exceptional talent. The Art of Problem Solving, a web site that trains students in mathematical concepts and problem-solving techniques, is also advertising the initiative to its worldwide online community. Ono heads the SOR program, with an advisory board of other mathematicians, including Manjul Bhargava (Princetone), Olga Holtz (Berkeley), Po-Shen Loh (Carnegie Mellon) and Sujatha Ramdorai (University of British Columbia).